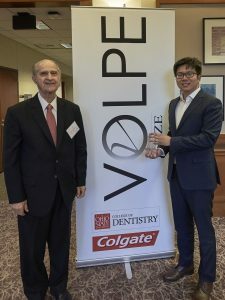 Graduate student Dr. Jiarui Bi won the prestigious Volpe Prize for the best clinical research in periodontology by students in dentistry. 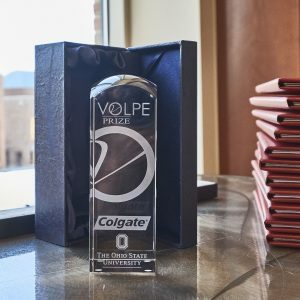 This is the second time a student from a Canadian university (and UBC) has won the award, which is sponsored by The Ohio State University and Colgate Oral Pharmaceuticals, Inc. The competition is open to periodontics students from dental academic institutions in North and South America. 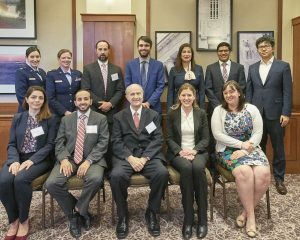 Bi’s winning presentation was made on April 20, 2018, at The Ohio State University in Columbus. Dr. Bi, who earned his dental degree at Wuhan University in China, is a PhD candidate in Craniofacial Science at UBC Dentistry. His graduate supervisor is Dr. Hannu Larjava, professor in the Department of Oral Biological & Medical Sciences. The title of Bi’s research is “Suppression of αvβ6 Integrin Expression by Bacterial Biofilms through Epidermal Growth Factor Receptor Signaling in Periodontal Disease.” He explains that in periodontal diseases, bacteria biofilm interrupts the healthy junctional epithelium of the gingiva, the barrier of maintaining the periodontal health, and transforms it to the pocket epithelium leading to inflammation. During this process, he notes, “we found one key molecule, αvβ6 integrin that regulates inflammation and is significantly reduced in epithelial cells of the pockets.” His research aims to understand the mechanism of this process and asks if by interrupting it: Could a new approach be found for treating periodontal diseases? His research found epidermal growth factor receptor (EGFR) signaling is highly involved in the suppression of αvβ6 integrin by biofilm. EGFR signalling is one of the major regulators of epithelial cell behavior. And after blocking this receptor, he succeeded in rescuing αvβ6 integrin from down-regulation by biofilm. Mostly surprisingly, he says, EGFR inhibitors reduced bone loss and inflammation in the mouse periodontitis model. Bi thinks blocking EGFR signalling could serve as a new approach to reduce inflammation and bone loss in periodontal disease. The Volpe Prize is awarded based on a combination of factors, chief among them the importance and quality of research, how it is presented by the student in an oral presentation, and the knowledge of the student about the research topic, as judged by a questioning period after the presentation. Bi says it is an honour to have won first place and receive the Volpe Prize. Dr Anthony Volpe (front centre) is surrounded by contestants for the Volpe Prize. Dr. Jiarui Bi (back right) won the prize—a second for both a Canadian university and UBC.